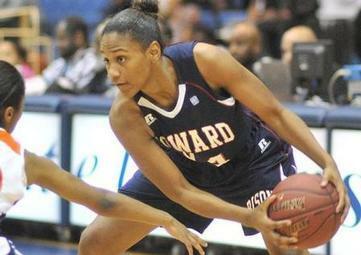 enior guard Tamoria Holmes hit a three-pointer in the last six seconds of regulation to secure a 50-49 victory for Howard in an exciting Mid-Eastern Athletic Conference (MEAC) matchup against Coppin State University (15-11 overall, 10-3 MEAC). This marks the first 20-win season for the Lady Bison since the 2000-01 campaign when the team went 21-10 under head coach Cathy Parson. The win also marks the seventh consecutive victory for the Lady Bison (20-7 overall, 12-2 MEAC) and puts HU ahead of Coppin State University (CSU) in the MEAC standings, just below Hampton and Florida A&M for third place in the conference rankings. Holmes tallied a game-high 23 points while collecting four steals and grabbing five boards on the night. Redshirt junior forward Saadia Doyle put together a solid effort with 12 points, six rebounds, and five steals. The Lady Eagles began regulation with five unanswered points. Doyle ended the run at 16:05 with a basket. Holmes then scored a lay-up to put the team to within one at the 15:41 mark. The score remained tight as both teams battled to take the lead. By halftime the score was knotted, 21-21. The second half tipped off with a quick jumper by Holmes at the 19:40 mark for a 23-21 margin. Coppin Senior forward Crystal Whittington tied the score again on the following play. Sophomore forward Larrissa Carter made a three-point play to give CSU a 46-43 advantage at the 2:13 mark. With 51 seconds left, Holmes then dropped a bucket inside the paint to decrease the margin to 46-45. CSU responded with a lay-up by junior forward Leola Spotwood with 41 seconds left in the ball game. Seconds later, a foul placed Spotwood on the free throw line. Spotwood converted just on one. Holmes answered with an immediate shot off the glass at 18 seconds. With the score set at 49-47, Holmes ended the game with a deep three-ball to win the game 50-49 over Coppin State.